This article uses graphical techniques to visualize one of my favorite geometric objects: the surface of a three-dimensional torus. Along the way, this article demonstrates techniques that are useful for visualizing more mundane 3-D point clouds that arise in statistical data analysis. 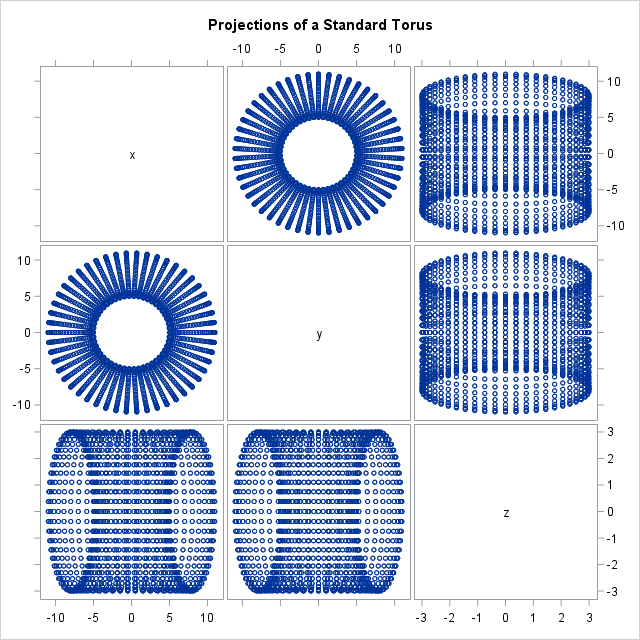 The SGSCATTER procedure displays the projection of the torus onto the three coordinate planes. In the (x,y) plane you can see that the object has a hole, but the projection onto the other coordinate planes are not very insightful because there is a lot of overplotting. 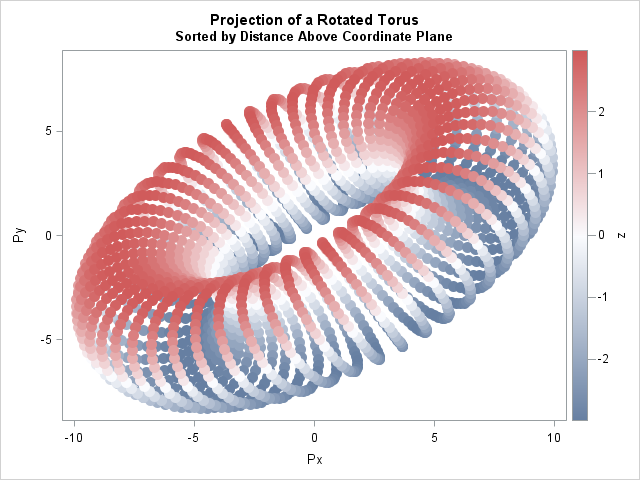 One way to avoid overplotting is to visualize the torus as a 3-D cloud of points. 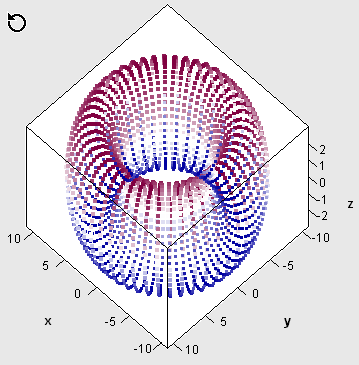 The SAS/IML Studio environment supports a rotating 3-D scatter plot, as shown to the left. In SAS/IML Studio you can interactively rotate the 3-D cloud of points, change the marker colors, and perform other techniques in exploratory data analysis. Alternatively, if you want to look at planar projections with PROC SGSCATTER, you can rotate the torus so that the projections onto the coordinate planes are not degenerate. My previous article defined SAS/IML functions that create rotation matrices. The following SAS/IML program is almost identical to the program in the previous article, so I will not explain each statement. 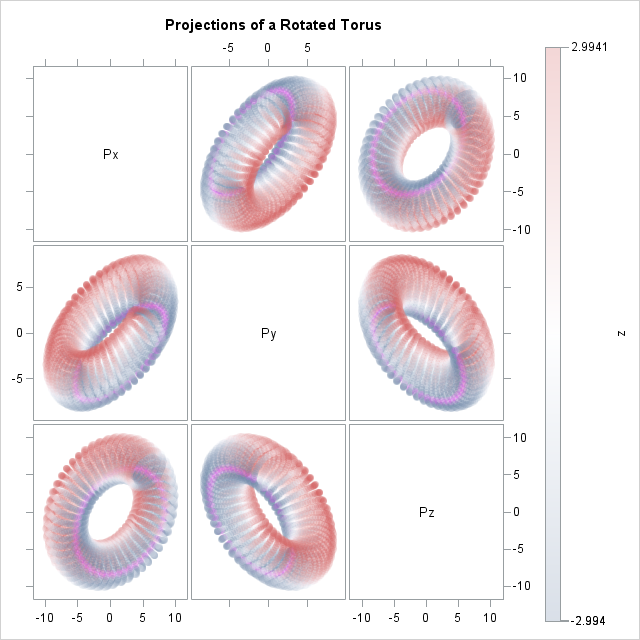 The program reads the Torus data set, rotates the points in a particular way, and writes the rotated coordinates to a SAS data set. You can use PROC SGSCATTER to project these rotated points onto the coordinate planes. The TRANSPARENCY= option creates semi-transparent markers that give the illusion of a ghostly see-through torus. This can be an effective technique for visualizing any point cloud, since it enables you to see regions in which overplotting occurs. The statements also use the COLORRESPONSE= option to color the markers by the (original) Z variable. The COLORRESPONSE= option requires SAS 9.4m3. The transparent markers serve a second function. The torus is composed of a sequence of circles. Therefore, the last circles (near θ = 2π) will obscure the first circles (near θ = 0) if opaque markers are used. The parametric construction is very apparent if you remove the TRANSPARENCY= option. If the projections of the data onto coordinate planes are degenerate, rotate the points. Use semi-transparency to reduce the effect of overplotting. Use the COLORRESPONSE= option to color the markers by one of the variables. This requires SAS 9.4m4. If you do not want to use transparency, sort the data in a direction perpendicular to the projected plane. That makes the rendering look more realistic. Your high-dimensional point clouds might not look as cool as this torus, but if you use these visualization tips, the data will be easier to interpret and understand. The SGSCATTER procedure in SAS is an easy-to-use routine for investigating relationships among several variables. Very cool visualization. Next step - animation.